Chelsea manager, Antonio Conte has said that catching up with Pep Guardiola’s Manchester City side would be a difficult task this season. The Italian said the focus now is to finish top four and play in the the Champions League next season. To achieve this, Conte urged his players to take a significant step by beating Stoke on Saturday. Chelsea’s chances of retaining the Premier League title are slim given Manchester City ’s record-breaking run that has left the Blues16 points adrift of the leaders. 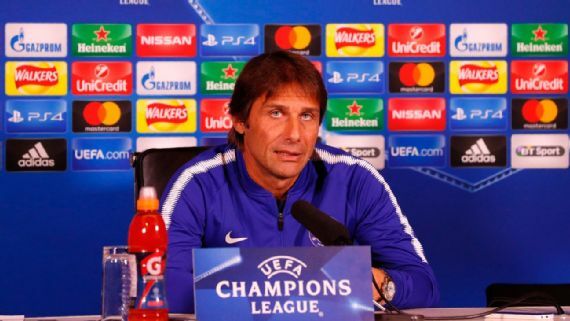 Conte told reporters, “In this league there is great motivation for all to try to stay there and fight until the end. “I don’t know if we can do this for the title because it depends on Manchester City, who are doing something extraordinary. “To win every game and draw one means you are having a fantastic run. “But there is great motivation to find a place in the Champions League next year, there are four places for six top teams.